Jonathan Sergison is an architect and cofounder of the London and Zurich-based Sergison Bates Architects. Since 2008, in addition to design work, Sergison has taught as professor of design and construction at the Academy of Architecture in Mendrisio, Switzerland. In an exhibition on the relationship between teaching and practice for the Sixteenth International Architecture Exhibition of the Venice Biennale, he shows how deeply connected these two passions are. Published to coincide with an exhibition at the 2018 International Architecture Exhibition of the Venice Biennale, Teaching / Practice takes the form of an interview on the interplay between these two fundamental aspects of Sergison’s practice, conducted by Irina Davidovici, an architect and senior research assistant at ETH Zurich’s Institute for the History and Theory of Architecture (gta). 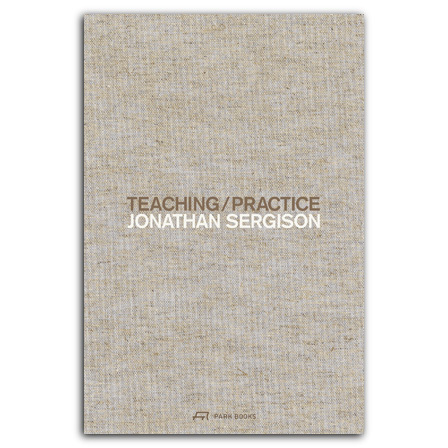 The book also offers five essays by Sergison, in which he explores some of the central issues his work addresses. In A Teaching Position, he questions the level of ability students ought to have when graduating from architecture school. In Twenty-One Lessons Learnt, he discusses what he has learned from his practice over the first two decades. Reflections on the European City explores an urban architecture of uniformity for a society of diversity, while Brutalism Remembered deals with the legacy of brutalism, and Re-use suggests an approach to an urban heritage shaped by the past. graduated from the Architectural Association in London 1989 and gained professional experience working for David Chipperfield and Tony Fretton before establishing Sergison Bates architects in 1996. He is also a professor of Architectural Design at the Academy of Architecture (Università della Svizzera intaliana) in Mendrisio, Switzerland.